Modern Warfare 2 Soundtrack Album Oscar Mike! Hans Zimmer, who has composed movie soundtracks for Hollywood flicks like Rain Man and Crimson Tide, scored Infinity Ward's blockbuster shooter Call of Duty: Modern Warfare 2.
Zimmer's Facebook fan page announces that an MW2 original soundtrack is in the works — no word yet on a release date or release formats. 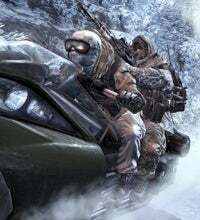 Last fall, Zimmer talked about his decision to score Modern Warfare 2, his first video game score. Unlike composing for a film, a video game score requires significantly more music. The composer told USA Today that it was the game's graphics which helped convinced him to take on the project. "You have to realize I like doing big movies that appear on a big screen," he said. "So the visuals and the audio have to be of a certain quality before I start to get excited about the thing."